Crawl space insulation is a helpful way to protect the inside of your home from outside air and keep it warmer in cold winter months. Insulating your crawl space can be difficult, but with the right products and the right help the job can be completed quickly and correctly. But before you jump right in and start installing fiberglass insulation in the crawlspace, doing some research on insulation materials may help you make the best decisions for your crawl space insulation. Silver River Basement Systems would like to invite you to meet with one of our crawl space specialists for a Free Estimate on making your crawl space more energy efficient- call or contact us online today to get started! 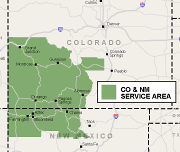 We serve Durango, Farmington NM, Grand Junction, and nearby CO & NM. Before you insulate your crawl space, you should make sure your crawl space is sealed properly. 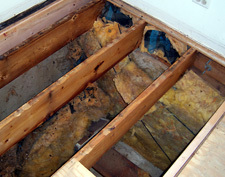 Vented crawl spaces are a thing of the past and can lead to wasted electricity due to humid air getting into your home. The U.S. Department of Energy writes, "Many building professionals now recognize that building an unventilated crawl space (or closing vents after the crawl space dries out following construction) is the best option in homes using proper moisture control and exterior drainage techniques." The crawl space insulation materials and the professionalism of the contractor installing them can impact how well your crawl space is insulated. High-quality materials and a trustworthy contractor can ensure that your crawl space stays warmer in the winter and drier in the summer. Basement Systems dealerships offer two great crawl space insulation products for homeowners. CleanSpace® TerraBlock™ is a 3/4 inch insulation sandwiched between 2 layers of poly film. 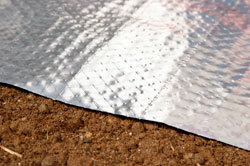 It offers great insulation and protection to dirt crawl spaces when combined with one of the CleanSpace® liners. For the ultimate in drainage and closed crawl space protection, add the CleanSpace® drainage matting. This trio of products is for those homeowners that are most interested in saving energy in their homes. 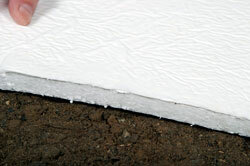 TerraBlock™ is the first crawl space insulation for the crawl space floor and the walls. It helps recapture any duct leakage, warm or cold, and helps contain it in the building envelope. CleanSpace® HeatBlock is a 10 mil cord-reinforced crawl space liner with UltraFresh antimicrobial protection. It works as another line of defense between your crawl space and the outside air. The shiny reflective surface stops heat transfer and reflects heat from your home into your crawl space keeping it warmer than the outside air. HeatBlock can be installed on both the crawl space walls and the crawl space floors, or just on the walls with another CleanSpace® product on the floor. It can also be installed over CleanSpace® Drainage Matting or Drainage Matting XL. This crawl space liner is perfect for crawl spaces with openings such as air ducts and furnaces. HeatBlock will recoup the energy loss through open ductwork and radiate it back into the room. All of these crawl space insulation products can be used together in different combinations in your crawl space as well to give you all the benefits of a complete system. Call us or contact us online today for your free crawl space inspection and quote! Silver River Basement Systems proudly serves Greater Grand Junction.